What happens in Ukraine does not stay in Ukraine — uncritical glorification of Ukrainian nationalism is the west’s problem too. 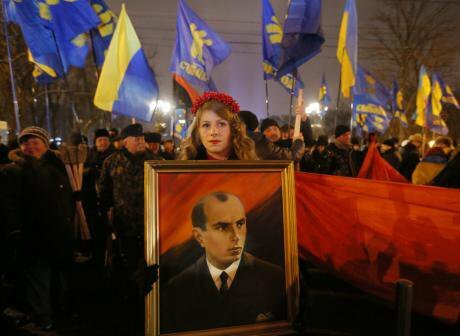 January 2016: a rally in honour of wartime nationalist Bandera's birthday in Kyiv, Ukraine. (c) Sergei Chuzavkov / AP / Press Association Images. All rights reserved.Recently, Ukraine has got the west’s attention. Views diverge as to why. Is it the site of an inspiring Revolution of Dignity or a hotbed of post-Soviet corruption? The battleground of a new Cold War or a symbol of short-sighted European foreign policy? A beacon of western values at the “gates of Europe” or a dead end of reform ruled by perennial oligarchs? All, some, or one of the above? The one thing agreed on is that what happens in Ukraine does not stay in Ukraine. This is true about the past as well. With Europe in a deepening identity crisis, the continent’s violent history in the last century still haunts European politics. And there are few countries where the dark forces of Europe’s recent past have clashed as fiercely as in Ukraine: two world wars, Nazism and Stalinism, right-wing nationalism and communist authoritarianism, murderous famine, ethnic cleansing and genocide have all left their scars. When we think about Ukraine’s past, we inevitably think about Europe’s past. When Ukrainian governments interfere in their county’s memory, they cannot help but touch issues resonant far beyond it. This is the backdrop of a public debate following an article by Josh Cohen recently published in Foreign Policy. The central issue at stake is the history of Ukrainian nationalism during World War Two and its prominent place in Ukrainian memory politics now. Ukrainian authorities started celebrating wartime nationalist leaders long before the current crisis. But Ukraine’s post-revolutionary government has ramped up this policy with legislation that not only bans communist symbols, but, against international protests from the west, also outlaws "disrespect" for independence fighters, explicitly including the far-right nationalists of World War Two. Now, streets in Ukraine’s capital Kyiv are about to be renamed after their leaders. This policy of state-sponsored glorification contradicts the known facts. After the end of Soviet Communism, research has made great progress. We now have a clear picture of an extremely right-wing and proudly authoritarian wartime nationalist movement that sought an ethnically purged Ukraine, all the while betting on Nazi victory. Many nationalists gained experience serving Nazi Germany in various police auxiliary formations. Nationalist leaders, even when Germany rebuffed their offers of collaboration, deliberately minimised confrontation, seeing Poles and Soviets as their main targets. In 1941, nationalist activists took part in pogroms that claimed the lives of thousands, perhaps tens of thousands of Jews. In 1943 and 1944, nationalist fighters carried out a campaign of systematic ethnic cleansing, killing at least 70,000 Polish civilians. They also targeted surviving Jews. Proclamations of a less radical course were issued late, when the war had clearly turned against Germany. They did not make a difference for the victims of continuing mass violence. After the war, nationalists fought a guerrilla campaign against brutal Soviet oppression. Soviet propaganda vilified them; Russian media now echo this propaganda. From this some observers mistakenly infer that wartime nationalism cannot have committed real crimes. But it did, and on a large scale. At the centre of this debate and Ukrainian policies to make heroes where Ukraine needs inquiry and reflection is the director of the Ukrainian Institute of National Memory, Volodymyr Viatrovych. In the past, Viatrovych ran the Center for the Study of the Ukrainian Liberation Movement, an institute geared toward celebrating nationalism more than studying it. He has also served as head of the former Ukrainian KGB archives, probably the single most sensitive document collection in the country. During this period, these archives released a highly selective list of perpetrators of the man-made Soviet famine of the early 1930s. The method of this list’s composition was unfathomable. But it was clear that many names on it "happened" to be recognisably Jewish. After his recent appointment as director of the Ukrainian Institute of National Memory in Kyiv, Viatrovych has pursued the same agenda, but from a more powerful position, allowing him to help criminalise "disrespect" for World War Two nationalists and ethnic cleansers. He has also secured the legal basis for permanent control over the former KGB archives. Viatrovych has produced publications denying the anti-Semitism of right-wing Ukrainian nationalist organisations and downplaying the deliberate ethnic cleansing of Poles as warfare with regrettable collateral casualties, triggered moreover by the other side — in effect, the victims. He denies nationalist cooperation with Nazi Germany and has circulated documents other historians recognise as forgeries, including a fictitious report of a Jewish woman supposedly saved by nationalists and a postwar fabrication purporting to show that nationalists refused to work with Germans. Many experts have been extremely skeptical about the academic merits of his publications. But the media, in Ukraine and the west, have been slow to notice the political bias of his activities. Challenged by Josh Cohen’s Foreign Policy article, Viatrovych has responded by doubling down. He denies the authenticity of a specific nationalist order to kill Polish civilians. He also denies that nationalists targeted Jews. Cohen's criticism triggered another deeply disturbing response: In an eerie echo of the stereotypes of World War Two nationalism, Askold Lozynskyj, the former president of the Ukrainian World Congress has stated that "Jews were the bulk” of the Soviet secret services which implemented the Holodomor, the murderous Soviet famine of the early 1930s. Ukraine’s current memory policies — soft on nationalist violence, strong on hero worship — contradict the democratic values its leaders profess and its people deserve. Ukraine is not unique. For instance, Russia is mobilising history even more aggressively. But Ukraine seeks to be part of the west now. Thus, like Hungary or Poland under its new nationalist government, Ukraine is of special importance. Some observers rationalise pro-nationalist memory policies as necessary to liberate society from Soviet legacies and produce unity. Yet the attempt to shape memory with a nationalist bias risks reproducing some of the stifling conformity and divisive manipulation of communist authoritarianism. Ukraine has historians and intellectuals offering an alternative to a nationalist agenda tied to the past. We should support them by challenging its new mythmakers. Join the debate on Twitter here. Interested in what's happening in Ukraine's public sphere? Check out this new article on polarisation and patriotic majorities.